A lot has changed on the Columbia International University campus since Amy Daugaard graduated in 1978. But when it comes to the center of CIU’s DNA, she says much remains the same. “My most prominent memories are a combination of friendships, the Bible being the authority for life, Ambassador Choir, and learning under some of the finest teachers I’ve ever sat under,” Daugaard reminisced at Homecoming 2018. As hundreds of alumni gathered for class reunions and a variety of events, the recent renovation of buildings and the expansion of academic programs caught the attention of many including 2006 graduate Mark Paul. 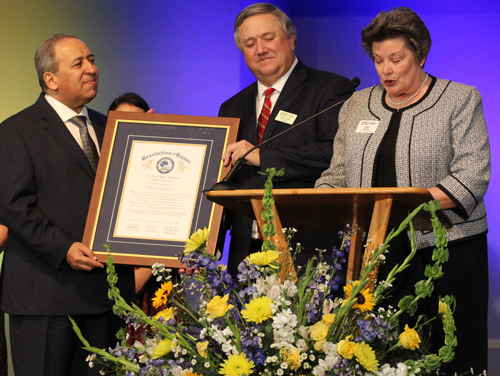 Highlights of the weekend included the Alumnus of the Year Chapel and the President’s Banquet featuring CIU’s four living presidents: Dr. Johnny Miller, Dr. George Murray, Dr. Bill Jones and current president Dr. Mark Smith. The Alumnus of the Year is Dr. Y. Armanious who has served as a cross-cultural leader in North Africa and the Middle East for more than three decades. He directs a mobilization office for a global cross-cultural ministry, and is the founder of an organization that trains workers from the churches in the region. He graduated from CIU in 2004 with a Master of Arts in Intercultural Studies. In the Alumnus of the Year Chapel message to alumni and the CIU student body, Armanious challenged believers to evangelism at home and abroad. “I am afraid that we stay in our comfort zone at the expense of precious souls,” Armanious said. He reported that one man with whom he shared the gospel was so receptive that he responded in shock at why Christians hesitate to witness about Jesus. “Why are you afraid? Why do you hide the good stuff? You are criminals,” the man said. CIU Intercultural Studies major Nathan Leonard said it was good to hear the embodiment of CIU’s values practically applied. Armanious was also the featured speaker at the President’s Banquet where he led alumni in prayer for CIU against any drift into theological liberalism and the dangers of success. Also at the Banquet, CIU’s fourth president Dr. Johnny Miller, was surprised with the status of Honorary Alumnus for his service to CIU as a professor and then as president from 1991 to 1999. Earlier in the evening, Miller shared that 2 Corinthians 4:7 is his life verse, highlighting that we are all “broken vessels” before the Lord and in desperate need of His strength to succeed in ministry. He noted that his struggle with Parkinson’s disease during the last decade has deeply reminded him of this truth. CIU has over 1,000 Prayer Partners. You can join them here. See a video review and photos from Homecoming here.